A Stagecoach bus driver from St Andrews depot, has been awarded the 'Driver of the Year' award at this year's Bus Driver Of The Year competition within East Scotland. Stagecoach has been recognised with three top honours at the 2018 UK Coach Awards. To celebrate the 100 year anniversary of Dunfermline depot, Stagecoach are opening the garage doors for a running day, packed full of heritage fleet displays and family activities on Saturday 19 May. 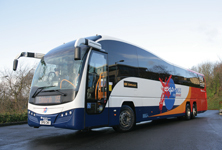 Stagecoach have announced plans to extend their X51 service which currently operates between Fife and Livingston, to continue into Glasgow from Monday 14 May 2018. Operators Stagecoach, Moffat and Williamson and Xplore Dundee, are sponsoring a penguin statue as part of the Maggie’s Centre’s Penguin Parade.